The old proverb necessity is the mother of invention is illustrated in the ideas of Internet and World Wide Web visionaries J.C.R. Licklider and Vannevar Bush. The difficult scenario that was the catalyst of their visionary ideas was surviving a war. Vannevar Bush was looking at the aftermath of World War II and looking at ways to make sure all the scientific data and lessons learned were not lost when he published an Atlantic Monthly article in 1945 titled "As We May Think." The article describes his theoretical machine called a "memex" that would be able to make links between documents. Many people point to "As We May Think" as the earliest published vision of the concept of hypertext. Bush worked hard during entire life to strengthen the relationship between government, business, and the scientific community. In the 1930s, as the president of the Carnegie Institution Bush informally advised the government on scientific matters. 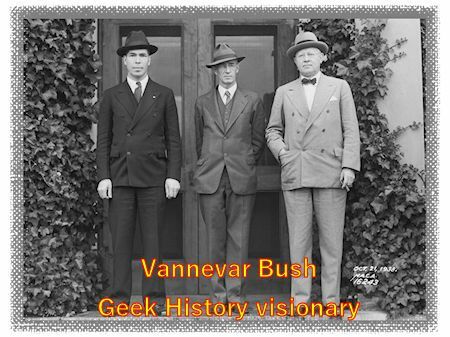 In 1938 Vannevar Bush was appointed to the National Advisory Committee for Aeronautics. In 1940 Bush felt the country needed a new organization to conduct military research and proposed his plan to President Roosevelt. The National Defense Research Committee (NDRC) was created with Bush as the chairman. Vannevar Bush represented the overall scientific community as the first presidential science adviser. In 1941 the newly created Office of Scientific Research and Development (OSRD) absorbed the NDRC. As director of the Office of Scientific Research and Development, Bush oversaw much of the United States’ wartime scientific research including the Manhattan Project and the development of the atomic bomb. Although Bush is most remembered for "As We May Think," another Bush article from 1945 entitled, "Science-The Endless Frontier" was equally influential. Bush outlined the importance of federally funded scientific research and called for a national research foundation. The National Science Foundation (NSF) was created in 1950 to support fundamental research and education in science and engineering. An internet search of the phrase "I think there is a world market for maybe five computers" will produce dozens of websites claiming those were the words of IBM Chairman Thomas Watson. The quote is often listed as one of the biggest epic fail statements of all times. We searched the net trying to find the source of the quote, and the verification that the statement was made by IBM Chairman Thomas Watson. Many websites often have the date 1943 attached to the quote, as was the case of a slide we found on the Microsoft website, and as it is presented on a page for the PBS television show Nova. For all the dozens of websites that list the quote attributed to IBM Chairman Thomas Watson, none of the websites have any information on the source or circumstances of the quote. Searching IBM websites and online IBM documents turned up an IBM history document that attributes the quote to a misunderstood statement made at a stockholders meeting in 1953. Almost universally you will find references that state that Tim Berners-Lee invented the World Wide. 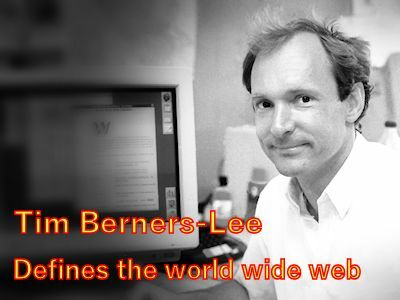 According to the World Wide Web Foundation, "Tim Berners-Lee invented the World Wide Web in 1989." But is it that simple? Like any use of the word invention, it is rarely a simple process of one person creating something new entirely from scratch. Let's define the world wide web and its components. Many people use the term internet interchangeably with "the web" or "world wide web." The internet is the information super highway, the infrastructure on which we travel. Web browsers and web servers make up the world wide web, the vehicle we use to travel on the highway. Read more about Who invented the world wide web?